Results of April 16, 2018 blood drive - Thank you to those who gave blood. We had a great turnout…saw 25 donors, and were able to collect 24 pints of blood. With your help, we will save 72 local lives. Special thanks to Donna Rupp and Linda Gochenauer for providing the food & Jan Keslar for organizing the event! We will once again have two Central Pennsylvania Blood Bank drives during 2017 and they are scheduled for: April 10 and September 11 in the Church House from 1:00-7:00PM. Jan Keslar will have more information closer to the date of the blood drives. · Results of April 10, 2017 blood drive - Central PA Blood Bank was pleased and greatful we provided space for a blood drive in the church house. They saw 24 people and were able to collect 19 units of blood. So, with everybody’s help, we were able to save 57 local lives. To the ladies and businesses who provided food, thank you so much! It was delicious as usual. Our next Central PA Blood drive is Monday, September 11. Mark your calendars now and hope to see you then!
. Results of September 11, 2017 blood drive - Central PA Blood Bank saw 25 people and we were able to collect 22 pints of blood. So with your help we will be able to save 66 local lives. Parish Blood Drives for 2016 - We will have two blood drives during 2016 and they are scheduled for April 11 and September 12 at Barren’s Church House from 1:00-7:00PM. There are signup sheets at each church; however, walk-in’s are welcomed! Blood Drive Results from April 11, 2016 - Thank you for another successful blood drive. They were able to see 26 people, and collected 25 pints of blood. So, with your help, we will be able to save 75 local lives! Looking forward to our next drive in September. Parish Blood Drives for 2015 - We will have two blood drives during 2015 and they are scheduled for April 13 and September 14 at Barren's Church House, 232 Kralltown Road, Dillsburg, PA. Family, friends, neighbors, and anyone in the community is welcome to give at our site. Questions, contact Jan Keslar, Linda Gochenauer, or Donna Rupp 717-432-4802. Blood Drive Results - We had 25 blood donors on Monday, April 13, 2015, with 21 pints collected by Central Pa. Blood bank. Thank you to all who came out. Also a big thank you to Linda Gochenauer and Donna Rupp for all the good food served. Blood Drive Results - We had 40 blood donors on Monday, September 14, 2015, with 34 pints acceptable by Central Pa. Blood bank. This will save 102 lives. Thank you to all who came out. Also a big thank you to Linda Gochenauer and Donna Rupp for the delicious food served. It is very much appreciated. 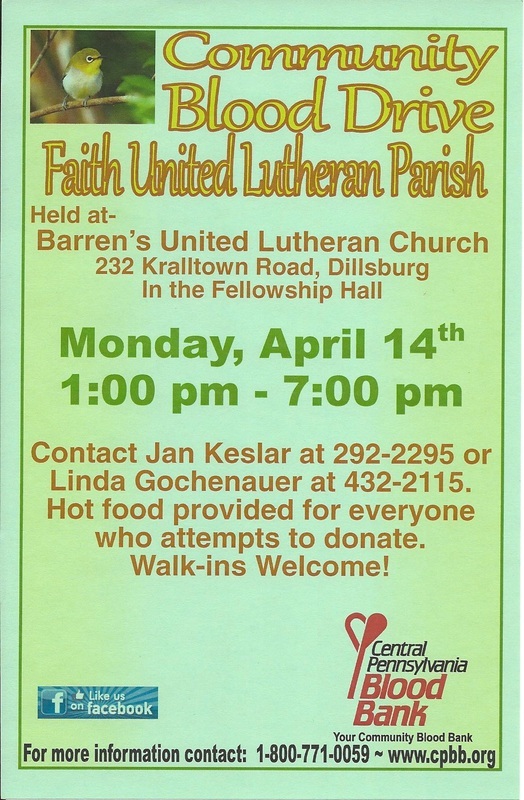 Parish Blood Drives for 2014 - We will once again have two blood drives during 2014 and they are scheduled for April 14 and September 8, 2014 in Barren's Church House, 232 Kralltown Road, Dillsburg, PA. Contact Jan Keslar, Linda Gochenauer, or Donna Rupp with questions 717-432-4802. Parish Blood Drives for 2013 – We will once again have two blood drives during 2013 and they are scheduled for April 22 and September 23.